Creating individual cards for those people whom are extra special in my life is such a joy. Matching each card to the personality of the recipient can sometimes be a challenge. Using handmade paper and some pre-printed card bases makes it so easy and even more fun. Today’s cards are for two friends who are shy and quiet, the cards fit them so well…smile. pale mauve slurry and make one or more sheets of medium weight paper..
2. Allow the paper to dry. remove the “ and s from the die cut). 3. 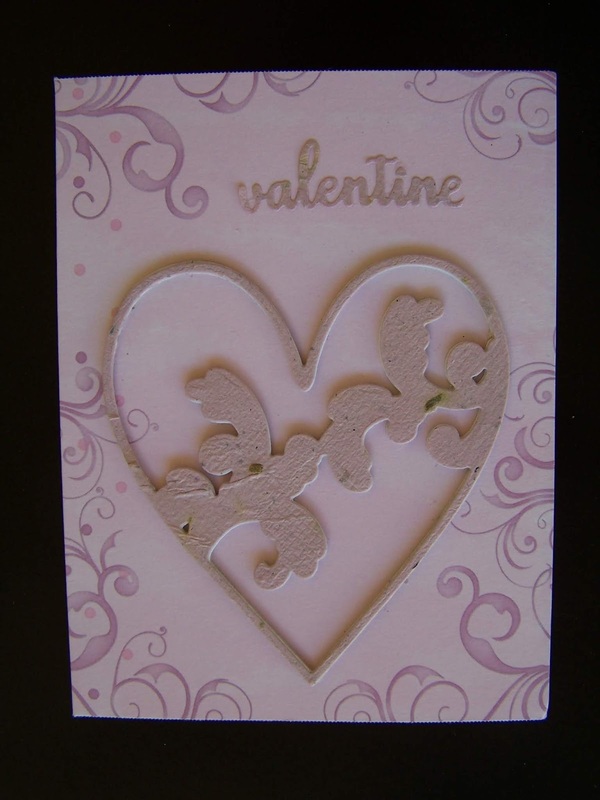 Attach the layered heart to the lower center of the preprinted card with ZipDry adhesive. 4. 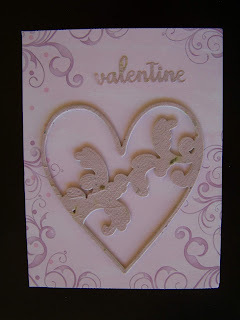 Attach the die cut word .”valentine” to the top center of the card. For the “Love” card (landscape” oriented) card. 1. Die cut one each of the word “Love”, “Devotion Heart” and “Fancy Heart Duo”. 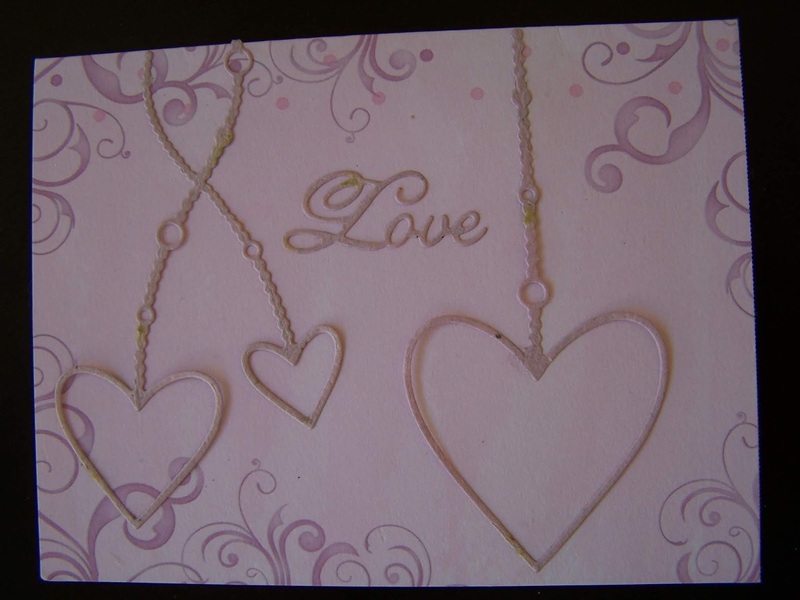 on the right, Fancy Heart Duo” on the left and “Love” in the upper center of the card. 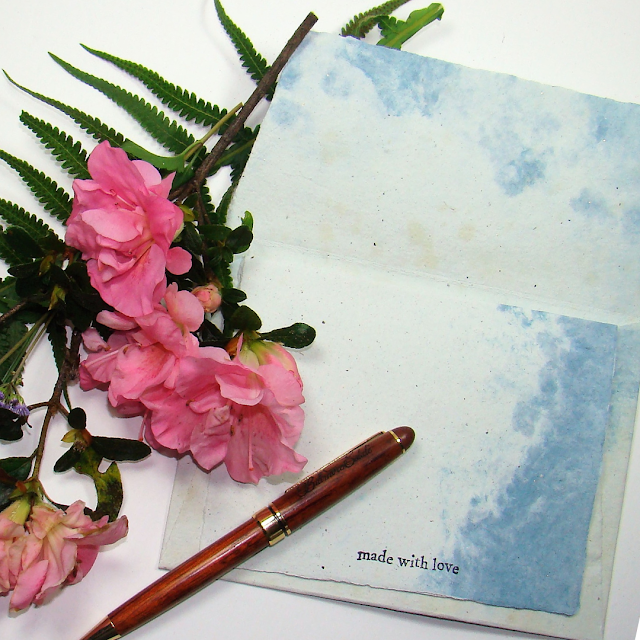 Add a personal message to the inside of the cards and send them on their way. 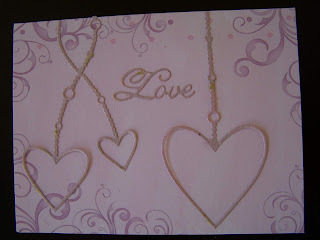 Thanks Terri.....it is always easy to create pretty projects working with handmade papers and castings. I was blessed with taking some classes from Arnold years ago. He opened a whole new world for me. Thanks Nancy. So easy and have been a big hit with the recipients. 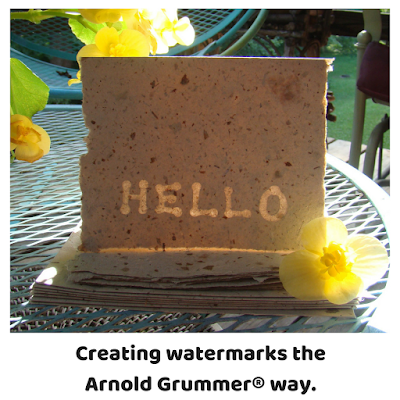 Today I am excited to share with you just how simple it is to create a watermark in your handmade paper. I have to admit, I haven't made paper in a while and I needed a fun project to jumpstart me back in action. Nothing inspires me more than watching the man himself, Arnold Grummer demonstrate how it's done by watching his videos. You can also get his book Trash to Treasure with great photos and clear instructions! He has a way of making everything look so easy so I thought I'd give it a whirl. I love to make stationery and I have been trying out some different designs lately, like making fluid borders the Arnold Grummer way! His paper making kits are the bomb and they will get you making your own paper quickly and easily. The first thing we all do is when we are making handmade paper is to decide what color paper we are going to recycle. There is the choosing of scraps we collected to tear into tiny stamp size pieces and then when we are making a border, we need two colors! The joy of designing your own paper is all about style! AND if you add some Gold Dust then you are adding pizazz to your paper! For this project, I made 2 different sets of stationary with matching envelopes but it's the same steps for both colors. First thing I did was to use my pour mold to create the base of the paper and then while the paper is still sitting in your vat of water you will want to squirt in your colored pulp along the side of the deckle. This ensures a fluid look to the border. Make your own "Oh My Sole!" cotton linter fish casting using my tutorial below! Is there anything more fun than whimsical dishes? Whenever I see a unique dinner plate or serving dish it calls to me to bring it home and add it (and in some cases, them) to my dining hutch collection. It's especially fun for me to serve meals using these dishes, when my guests least expect it. It makes for stimulating and fun conversation and a lighthearted atmosphere to the evening. Life is short and far too precious to eat on boring dinnerware. In this house we eat our meals together, and we have fun doing so. We drink our Sunday morning orange juice from champagne flutes, our ice water from wine goblets, our wine from beautiful China teacups and every so often our meals on whimsy plates. Why, you ask? Well, for FUN of course!